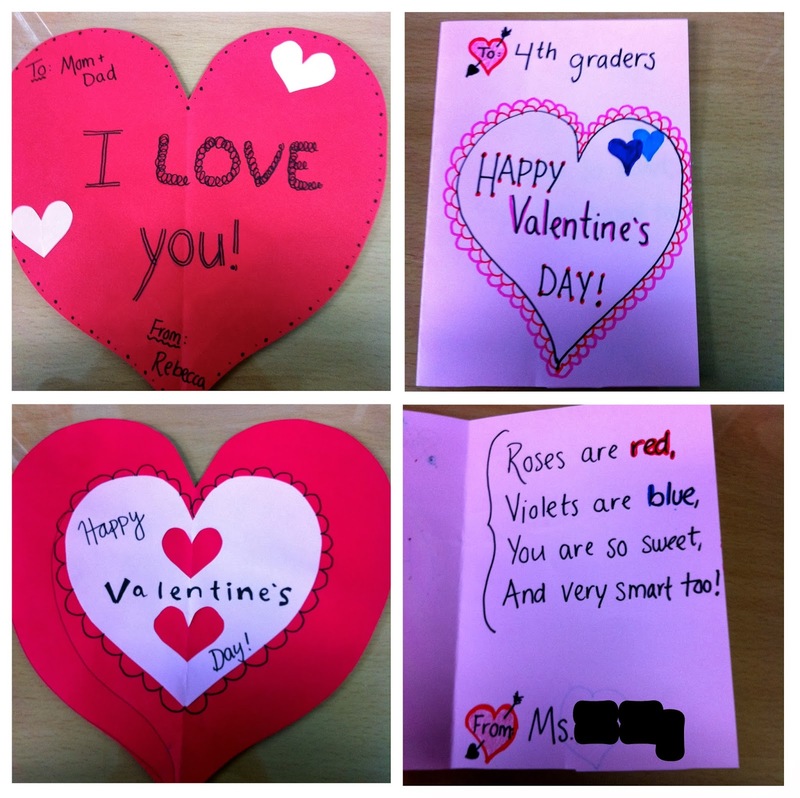 So in case anyone's still looking for an elementary Valentine's Day lesson for tomorrow, I'm sharing my plans because I think it went well. This is the Valentine's Day powerpoint I made for my elementary students. 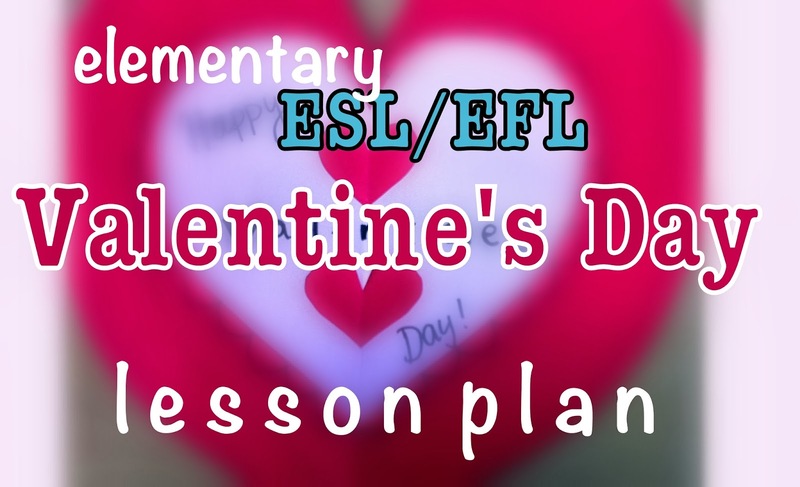 My co-teacher helped out and added some explanations in Korean after my English (during the History and Valentine's Day at School sections mostly), since their level is fairly low yet. The students really seemed to enjoy this activity. I used page 2 of these free printable Valentine's Day notes to make the puzzles. I printed the second page (the blank valentines) on 6 different colors of paper since our classroom is set up with desks in 6 pods. On each heart I wrote either a short phrase or word that they just learned in the powerpoint. Note: It's okay to repeat phrases on different colored papers. 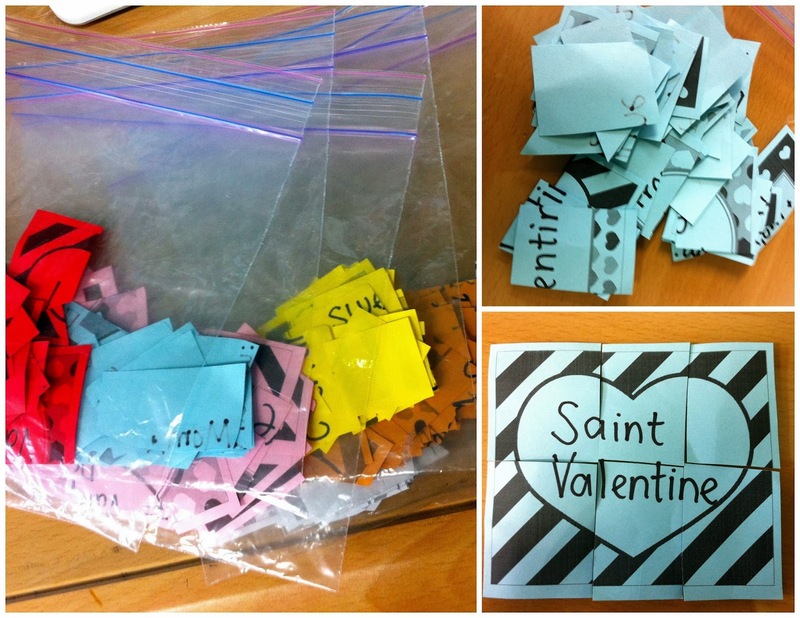 I think each colored set had "Happy Valentine's Day" and "I love you" so that the students would learn the phrases. Then I cut out each square, and finally cut them into pieces. I made sure that in each ziplock bag, one puzzle had four pieces, two puzzles had six pieces (2x3), and two had nine pieces (3x3). The sixth puzzle was cut however I felt like it at the time. This way, the students finished at least one puzzle - the easiest - and kept working on the others. So each group got a bag, and they had 2 minutes to put together as many puzzles as they could. When the time was up, students had to put their hands on their head. Then my co-teacher and I went around to each of the groups. They had to read us their completed puzzles to get a point (1 point per puzzle). After I'd check a group, they could put the pieces back in the bag. Then we passed the bags in one direction and repeated. We passed the bags four times, as we were running out of time and I knew it would take a while for students to make valentines. Hangman isn't an Eastern game, so my co-teacher and I thought it would be kind of violent and unethical to draw a person being hung on the blackboard in front of these elementary children. Rather, I drew 10 small hearts on the board. When students guessed a letter that wasn't in the answer, I wrote the letter on the board and erased a heart. This was really good practice for them to say letter names and review the new words we'd just learned. One time I used "chocolate" and they had every letter except the "a". It took a few wrong guesses before one group finally guessed "a" for that spot. If you need to fill more time, you can then let them play in small groups on white boards (if you have small white boards available). We did not have time, but if you plan to do this, I suggest preparing slips of paper with various phrases written on them. That way the student with the marker/board can look at the word or phrase and reference the paper throughout the game. We gave each student one piece of red paper and one piece of pink paper (just regular A4 printing paper that we had in the room). Glue sticks, scissors, and sign pens were also available. Hardly anyone was done when the bell rang, so know that it will take students at least 25 minutes to get going. My mom recently sent me some glittery heart stickers in the mail, so when students finished their valentine, they lined up in front and got to put two heart stickers on their valentines. They were so excited about those stickers -- thanks mom! Afterwards we had a regular 40 minute 4th grade class that got switched from yesterday. So I presented the Valentine's Day powerpoint and we did the Valentine's Day puzzles (only passed bags 3 times), which took up the entire time (we also sang "Let it Go" from Frozen during the first 5 minutes of class, and students came a bit late). So you could easily adjust and make this a 40 minute lesson by cutting out activities.